1 ltr , 5 ltr. Elixir is a natural organic systemic fungicides, which gives preventive as well as curative control on Powdery mildew. After spray Elixir, immediately absorbed in the plant and acts as anti sporulant. 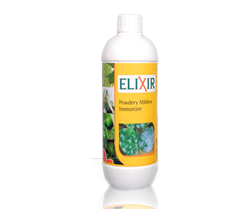 Elixir is a natural systemic fungicide, which gives preventive as well as curative control on powdery mildew. Elixir gives longer control over the disease. Elixir due to its systemic action, it saves new shoot, leaves from the powdery mildew. Grapes, Chilly, Capsicum, Tomato, Floricultural Plants etc.